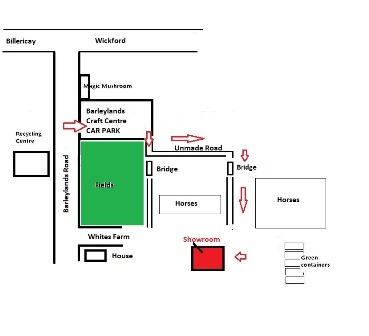 Please visit our Showroom, ample free parking FROM BARLEYLANDS FARM AND CRAFT VILLIAGE CAR PARK FOLLOW THE SIGNS!! Please drive to the end of Barleylands Farm and Craft Village Car Park keeping to the right and take the second unmade road on the right, over the small bridge and follow the unmade road to our Showroom. Exit at J29 onto A127 Southend bound. Exit at A176 junction for Basildon/Billericay. At the roundabout take the third exit on to South Wash Road. At the second mini roundabout turn left on to Barleylands Road. Barleylands car park is situated one mile down on the right hand side. To our Showroom:Please drive to the end of Barleylands Farm and Craft Village Car Park keeping to the right and take the second unmade road on the right, over the small bridge and follow the unmade road to our Showroom. Exit at J16 onto B1007 towards Billericay. Drive through Billericay High Street and continue over the roundabout on to Laindon Road. At the roundabout take the 3rd exit on to Noak Hill Road and then take the 1st left on to Church Street. At the end of the road turm right on to Southend Road and then turn right again in to Barleylands Road. Barleylands car park is situated 1/2 mile down on the left hand side. To our Shorwoom: Please drive to the end of Barleylands Farm and Craft Village Car Park keeping to the right and take the second unmade road on the right, over the small bridge and follow the unmade road to our Showroom.